At Kiosk, we’re obsessed with numbers, stats and data. Today, it’s the number three that we’re happy to highlight. As in three new Kioskers. Say hello to Angie Martinez, Sydnee Brooker and Christian Johns. Angie Martinez joins as a data analyst with knack for finding extreme relevance in a sea of data. Her insight and analysis work in the online Dating and Introductions category helped many a San Francisco single find an ideal match. Angie’s taken a passion for behavioral science to the next level as an economics graduate and MBA candidate at Sonoma State University, where she holds the position of research assistant to Dr. Steven Cuellar, the Chair of the Economics Department. What drew Angie to Kiosk? The opportunity to “work creatively alongside a highly intelligent team of people.” Specializing in quantitative marketing analysis using econometric modeling, Angie will be helping Kiosk clients visualize market trends and business opportunities. Vital skills when it comes to finding the perfect customer match. 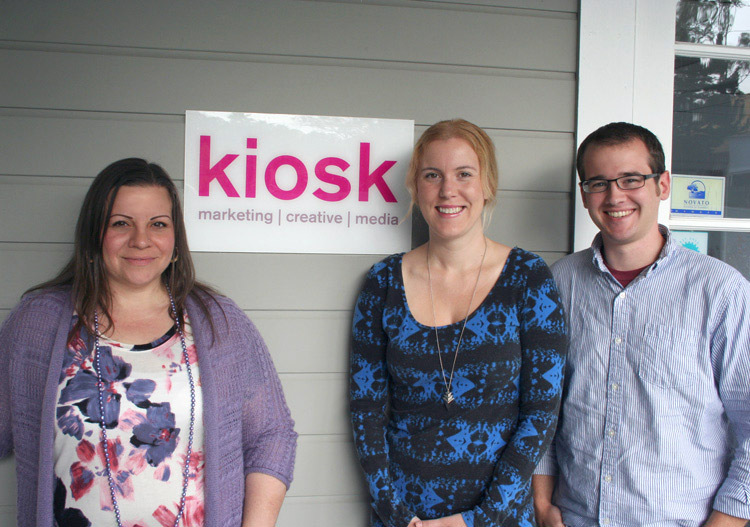 Sydnee Brooker is Kiosk’s new search marketing maven. Having earned a BA in journalism at San Diego State University, Sydnee combines a creative writing sensibility with a deep knowledge of, and curiosity about, evolving social platforms. Driving SEM campaigns for Kiosk clients gives her the satisfaction of translating well-researched words into client-pleasing results. She loves the fact that Kiosk offers a “well organized environment with the resources to master SEM for our clients” and in her spare time enjoys live music, cooking and travel. Kiosk’s newest web developer, Christian Johns is a self-confessed stats geek. He comes to us from the well-respected O’Reilly School of Technology, where he developed and supported online learning tools. Like Angie, he cites “exceptional people” as a motivating factor in his desire to join the team. Talking of teams, Christian’s love of stats carries through to his love of sports. A Truman State University grad, when he’s not working on Kiosk’s proprietary dashboard technologies, he keeps a close eye on the numbers put up by the University of Nebraska Cornhuskers.